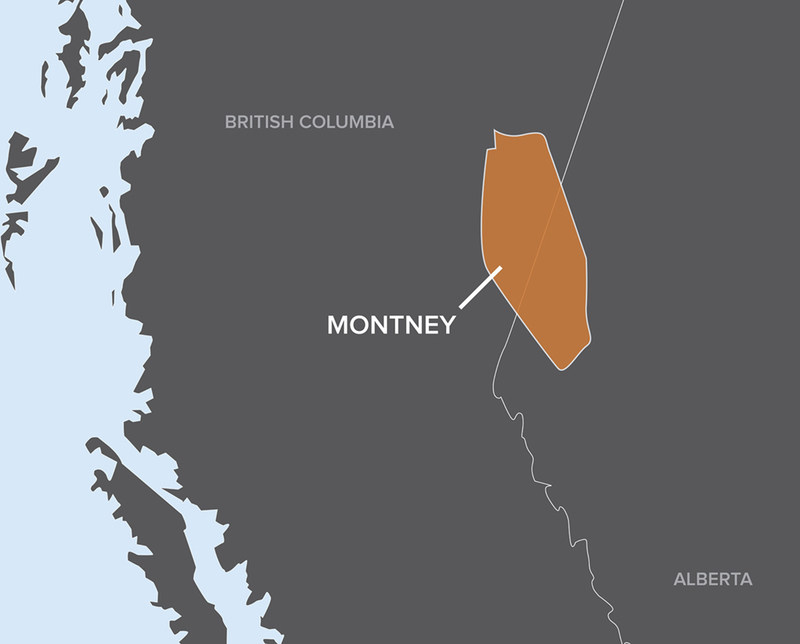 The Montney formation covers an area of approximately 246,000 km2 (95,000 sq. mi.) stretching across Alberta and British Columbia. It is a leading example of an unconventional gas play in the Western Canadian Sedimentary Basin containing vast quantities of proven gas reserves. Estimates of gas in place are up to 700 Tcf. The Montney consists of four distinct intervals: the Upper, Middle, Middle Lower and Lower. Characterized by its low permeability (0.01 – 0.5 mD) and thick stack, the Montney is a prime candidate for horizontal drilling and hydraulic fracturing techniques. The formation is a blend of sandstone, siltstone and shale intervals with porosity up to 8% and true vertical depth to 3,950 m (13,000 ft). Completion methods in the Montney have evolved from cemented liner to open hole completions due to increased operational efficiencies and higher production provided through the open hole lateral. To further reduce costs, operators have opted to cement back the vertical and build section of the open hole wellbore rather than running intermediate casing with a liner hanger packer. Cemented-back methodology allows for advantages gained with open hole completion systems while reducing total wellbore construction costs due to the elimination of intermediate casing. Cementing-back open hole StackFRAC® system completions involves incorporating a traditional stage collar into the casing above the uppermost RockSEAL® packer. After the system is installed, a ball is dropped to close the Toe Circulation Sub. Internal liner pressure is increased to set the RockSEAL packers along the system. Pressure is further increased to shift the stage collar sleeve open and allow cement to flow up the annulus. To stop cement flow, the sleeve is moved to a fully closed position by dropping a wiper plug. The plug latches into the stage collar and, with hydraulic pressure from inside the pipe, mechanically slides the sleeve closed isolating the cementing ports. To complete further well interventions, such as dropping balls to actuate open hole systems, it is necessary to drill out the plugs and clean out any remaining debris. This can be a costly and time consuming process requiring up to four trips. A drillable debris sub is commonly placed below the stage collar in order to catch any material before it can travel further downhole. The Packers Plus StackFRAC (SF) Cementor™ stage collar is the latest innovation available to cemented-back completions. As with current stage collar designs, the SF Cementor is hydraulically activated; however, it is designed to close without the use of a plug or dart. This design reduces post-cement cleanout operations, significantly lowering the likelihood of issues associated with debris in the system. It also mitigates the need for a cement head and manifold. The SF Cementor is assembled in the completion string above the open hole system. When the packers have been set, the tool string is further pressured up to hydraulically open the SF Cementor. The cement is pumped and then displaced using a high viscous pill and spacer fluid. This procedure eliminates the need for a wiper plug to clean out the liner and thus any debris associated with its drillout. Once cementing is complete, the SF Cementor is mechanically closed and locked by lowering the casing and applying compression on the tool to isolate the ports. With fewer cleanout trips required, well stimulation operations can commence. In case of incomplete closure, the secondary close mechanism ensures complete sealing while maintaining full inside diameter to allow for stimulation of all stages. The efficiencies of the SF Cementor were put to the test by a major operator in multiple field trials in the lower Montney. In total, the operator cemented-back 17 wells with 12-to 14-stage StackFRAC systems. On average, the SF Cementor was run at a depth of 2,650 m (8,700 ft). The tools were landed between 45 and 90 degrees from the vertical. One of the deepest installations of the SF Cementor landed at 3,165 m (10,380 ft) and 56 degrees from the vertical. The tool, which had pressure capabilities rated to 103 MPa (15,000 psi), was run above a 14-stage StackFRAC Titanium® XV system designed with the same pressure rating. The SF Cementor opened at 19 MPa (2,750 psi) and cement was placed in the annulus followed by a viscous pill and spacer fluid to displace the cement from the liner. The tool was closed in a single attempt and one drillout trip was performed. Cemented-back completions eliminate the need for intermediate casing and reduce wellbore construction costs. The development of the Packers Plus SF Cementor stage collar has further helped operators improve operational efficiencies of open hole, cemented-back completions by reducing the number of cleanout trips required. Cemented-back completions are applicable in any field where there is sufficient wellbore stability to maintain integrity while the horizontal is being drilled. The SF Cementor stage collar has been run in a variety of formations and lithologies in the U.S., Canada and internationally.